The Blood Cancer Center of Sarah Cannon Cancer Institute, located at Research Medical Center, provides specialized care for acute leukemia and complex blood cancer patients. The Program provides comprehensive outpatient services and a dedicated inpatient oncology unit supported by a multidisciplinary team of specialists and staffed by oncology-certified nurses. The specialists at the Sarah Cannon Blood Cancer Center offer the latest advancements in treatment including clinical trials and immunotherapies from the nationally renowned Sarah Cannon Cancer Institute, one of the leading providers of blood and marrow transplants in the world. 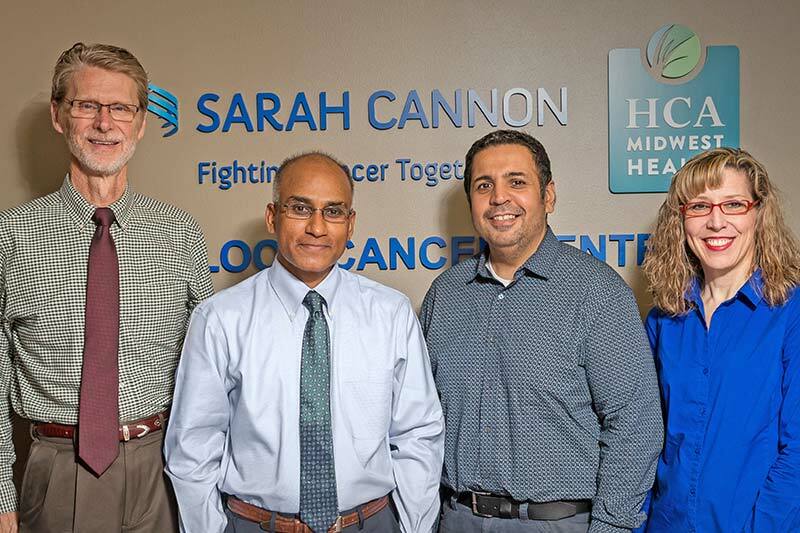 Suman Kambhampati, MD, along with Frank Slovick, MD, are the Co-Medical Directors of the Blood Cancer Program at the Sarah Cannon Cancer Institute HCA Midwest Health located at Research Medical Center. Dr. Kambhampati provides oversight and treatment for complex hematology and blood cancer patients, with specialized clinical interests in acute leukemia, elderly leukemia, chronic lymphocytic leukemia, Myelodysplastic Syndrome and multiple myeloma. Dr. Kambhampati is the vice-chair of the Sarah Cannon Blood Cancer Network Quality Management Committee on complex blood cancers. He also serves as the principal investigator with the Southwest Oncology Group (SWOG), an affiliate of the National Cancer Institute (NCI), and leads efforts at the VA to enroll patients into sponsored clinical trials. Dr. Kambhampati completed fellowships at the University of Illinois and the Feinberg School of Medicine Northwestern University. He is board-certified in internal medicine with the subspecialty of clinical oncology/hematology. Frank Slovick, MD is a dedicated and compassionate medical oncologist specializing in treating those patients with blood disorders and blood cancers. Dr. Slovick completed his fellowship in hematology at the University of Rochester and his medical oncology fellowship at the University of Missouri-Kansas City’s Truman Medical Center. He is board certified in medical oncology/hematology. Jaswinder Singh, MD, is a well-respected medical oncologist who is dedicated to the care and well-being of his patients. Dr. Singh completed is fellowship in hematology/oncology at the University of Kansas Medical Center. He is board-certified in oncology/hematology. Julie Wilhauk is an advanced practice nurse who received both her Nurse Practitioner and her Doctorate in Nurse Practice from the University of Kansas Medical Center. She is board certified as an advanced oncology nurse practitioner. Julie will provide support for comprehensive health management as well as the highest quality of care that is reflective of the culture at Sarah Cannon HCA Midwest Health in patients with blood cancers including performing bone marrow biopsies and management of patient needs. By joining the Sarah Cannon Blood Cancer Network, the Blood Cancer Center of Sarah Cannon HCA Midwest Health made the commitment to work with the other programs in the Network to standardize our quality platform, infrastructure, training and research to provide an unparalleled experience for patients seeking treatment for blood cancer. The clinical and operational efficiencies inherent in standardization and coordination of capabilities make the Sarah Cannon Blood Cancer Network well-positioned to provide quality care while demonstrating superior value. Sarah Cannon HCA Midwest Health offers an Oncology Alert Patient Care Program, the only program in the region that focuses on promptly identifying and treating immunocompromised oncology patients arriving through the cancer clinic or the Emergency Room. The program provides special training to ER and clinic staff to identify and address the unique needs of chemotherapy patients.